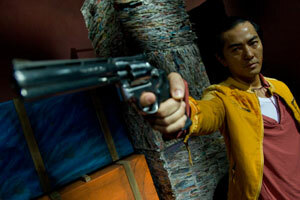 (left) Jordan Chan, and (right) Ekin Cheng vie for triad leadership in Once a Gangster. The Skinny: Felix Chong's direction is a bit shoddy, but this triad satire has enough funny and familiar stuff to warrant it a thumbs up. Seeing Jordan Chan and Ekin Cheng play against type is half the amusement. The Infernal Affairs parodies are good too. by Kozo: Ekin Cheng and Jordan Chan are back - though things aren't what they used to be. Writer-director Felix Chong's Once a Gangster brings back the Young and Dangerous boys in a triad movie satire about aging gangsters thrust into a potential gang war where only one can emerge victorious. The winner gets to be head of the Wo Yee Sing triad, while the loser gets absolutely zip. The twist: Roast Pork (Jordan Chan) wants to be the loser. He's only up for the top spot because his lousy boss Kerosene (a hilariously scheming Alex Fong Chung-Sun) wants to saddle Roast Pork with the gang's large debt. Can Roast Pork find a way to extricate himself from the triad election and continue his dream profession, to be a chef? It won't be easy. Roast Pork is being cajoled into the leader/fall guy role because of such concepts as honor, brotherhood and face – you know, the stuff that usually makes for good triads in your typical Hong Kong movie. Kerosene essentially uses a guilt trip to force Roast Pork into the running, but Roast Pork plots with his randy wife (a funny and fiery Michelle Ye) to somehow get out of the situation. Their best bet is the offspring of loud triad madam Pearl (an overacting Candace Yu). Her son Sparrow (Ekin Cheng) was promised leadership after a 20-year stint in the slammer, and when he's freed he immediately gets a huge entourage and heads into town, grinning like some would-be triad kingpin. Who'll be the top dog, the chef who doesn't want to be Number One, or the suave ex-con who seemingly wants the job? It should be obvious, right? Unfortunately, Felix Chong's direction isn't so sharp. Chong previously co-directed such films as Moonlight in Tokyo and Overheard, one a quirky character comedy and the other a solid commercial thriller. Once a Gangster skews towards Moonlight with its sometimes dark and off-kilter laughs – but this sort of comedy is hard to effectively present. Chong is no Pang Ho-Cheung (probably Hong Kong's best director at mounting effective satire), and sometimes the gags sag underneath suspect camera placement or shot length. Also, the film was clearly done on the cheap, and Chong doesn’t compensate well. Many scenes take place in distracting darkness, where the shadows seem to exist only to hide the fact that they couldn't afford quality art direction. The performances are wildly uneven too, with many of the actors seemingly acting against rather than with one another. For a first-time solo effort, Felix Chong does a passable job, but there's room for improvement.